Energy drinks and shots have received a significant amount of attention in the press recently. Reports have linked them to numerous deaths and hospital admissions. Most of these energy drinks have about twice the amount of caffeine as a cup of coffee. Energy drinks will make you dehydrated and anxious. 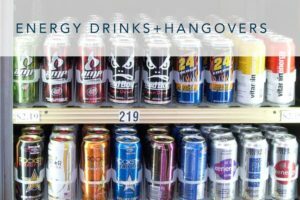 One other issue with energy drinks is that, when combined with alcohol, they increase the severity of a hangover. After treating thousands of hangovers (more than any other doctor in the world,) I have noticed that people who drink more than 2 or 3 energy drinks in a night tend to have some of the worst hangovers imaginable. At our Las Vegas hangover clinic, we have seen some clients that have consumed as many as 12 Red Bulls in one 12 hour span of partying. When I go to do an in-room treatment and I see empty 12 packs of Red Bull outside their room, it is always a sign that I have my work cut out for me. 1. Dehydration from the alcohol (inhibition of antidiuretic hormone). In other words, you pee a lot when you drink alcohol. 2. Caffeine in the energy drinks makes you urinate as well since caffeine is a diuretic. 3. Energy drinks raise your blood pressure, which makes you pee even more. Suffice it to say, these clients are very dehydrated. To further complicate the situation, energy drinks allow you to stay up longer and party more, which, consequently, means you drink more. I am all about having a good time, but 12 energy drinks, gallons of alcohol, and 14 hours of straight partying usually concludes with a very serious hangover and significant stress on the body. Back when we were 22 years old, we were able to tolerate this kind of behavior to a certain degree. But, most of the clients I see in my hangover clinic are in their 30’s or early 40’s. Unfortunately, metabolism slows as the years go by. As a result, metabolism slows and sleep becomes more important as the body recovers at a slower pace after age 30. One component of Hangover Heaven is educating Las Vegas tourists on “Sustainable Vacations.” Some people might think this is about eco-tourism, but it is about enjoying your entire time in Las Vegas. I see many four or five day bachelor parties where the guys are exhausted on day 3 because they partied too hard. Don’t let this happen to you. I have a number of tips on this blog to help you make the most of your time in Las Vegas. Getting back to the energy drinks, more data is definitely needed before we conclude how culpable the energy drinks and alcohol combo is in the increased number of deaths and hospital admissions. Until we have more information on this complicated combo, limit energy drinks to 2 per day and get at least 4 hours of sleep a day when partying in Vegas. To lessen the severity of a hangover when combining energy drinks with alcohol, drink a lot of water and beverages filled with electrolytes, such as Pedialyte, to hydrate and replenish your system. Trust me, the next morning your body will thank you for it. Learn more about Dr. Burke’s Hangover Support Supplements. Learn more about the Hangover Heaven IV Hangover Cures.